high performing skin care brand on the market. Im Artikel über das Luxushotel Park Gstaad in Gstaad / Schweiz dürfen unsere Produkte natürlich nicht fehlen – man kann sich Gesichts- und Körperbehandlungen mit JK7® Luxurious Natural Skin Care gönnen. Vor rund 10 Jahren gründete der Biochemiker, Chemiker, Alchemist, Heilpraktiker, Psychologe, Kräuterkundler, Aroma-Therapeut, Experte für Ernährung und Hautpflege, Erfinder, Autor und Spiritualist Dr. Jürgen Klein seine Bio-Pflegemarke JK7. „Der Zauber schöner Haut! Wie wirkt Naturkosmetik im Vergleich zu regulärer Pflege?“: Interview mit Dr. Jürgen Klein. 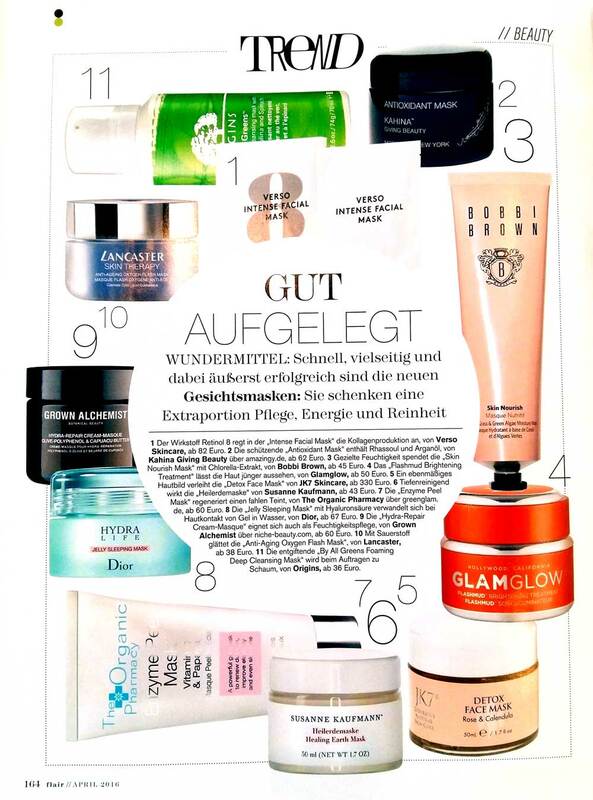 Our Beautifying & Rejuvenating Cream is featured in the “Für Sie Favorit“ Section of „Für Sie madame, Monsieur“ Magazine. And the next issue (November 2018) will have an interview with „Autor, Visionär und Alchemist“ Dr. Jürgen Klein. Unsere Produkte werden in diesem Blog Artikel über die VIP Lounge und das VIP Service im Flughafen Zürich erwähnt, da sie in der VIP Lounge erworben werden können. Our JK7® Detox Face Mask is featured in the “Beauty Wish List” Section of Waterfront magazine. Eluxe Magazine tried and tested 5 cruelty free beauty brands. Not hurting animals is very important to us, so we’re happy to have been part of their article. JK7® Luxurious Natural Skincare is featured in the Hot Picks section of North East Lifestyle magazine. Zhenyi Ma from .Cent Magazine encapsulates the essence of JK7® with these words: „Clean. Pure. Wholesome.“, and goes on to say: „This is the brand if you’re seeking for that untainted, non-artificial solution to the best skin. This is the brand if you want to fulfil both criteria of organic and natural.“. Hollywood hat den lange in die Schublade “Öko und Birkenstock” gelegten Naturpflegeprodukten einen frischen Vibe eingehaucht. 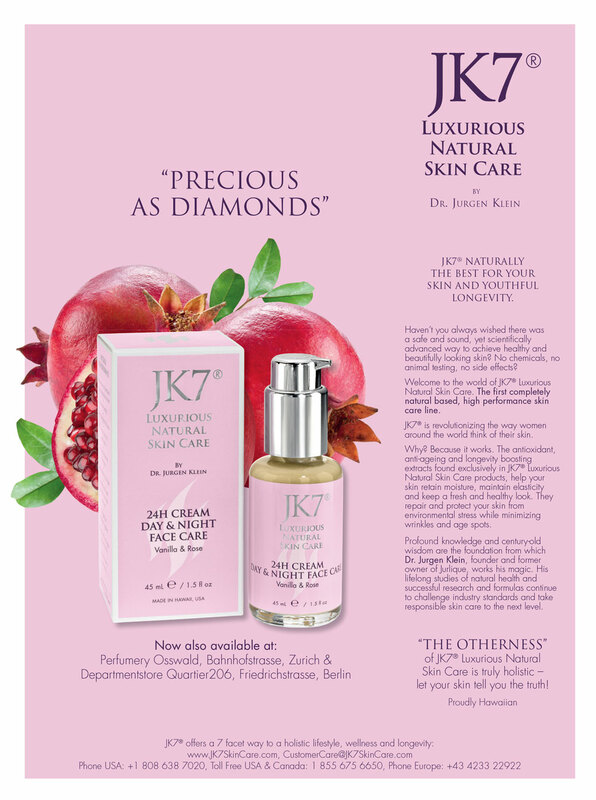 JK7® Luxurious Natural Skin Care by Dr. Jürgen Klein ist der Rolls Royce unter den Kosmetikbrands. Beautiful summer skin is about so much more than good genes, although they do help. Getting that dewy, sunkissed, all-natural look when it’s 30 degrees outside and you’re in and out of air conditioning is all about good prep and excellent products. Luckily, one of the world’s most luxurious beauty and skincare brands, Jurgen Klein’s JK7, all made in Hawaii, will help you on your way to summer skin nirvana. Is the world's priciest face cream really worth £900? Shimmer, Shine & Sparkle This Summer! SO Magazine writes about the best in cousine, wines and lifestyle. 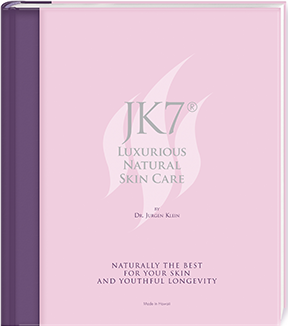 If you are interested in „appreciating the finer things in life“, then JK7® Luxurious Natural Skincare is the right experience for you. Nina Hobson from The Expater loves our Golden Face Oil. She starts her article saying: „I cannot be held liable for any conflicts resulting from you trying this brand, falling in love with it and then finding it really, really hard to go back to your old skincare routine.“ and finishes off with following words: „It’s hard to switch back to the rest when you’ve tried the best… This oil might not make you a less selfish person, but boy, it will give you really, really lovely skin.“ … what more is there to say? JK7® Luxurious Natural Skin Care says hello. An introduction of JK7® in Princess magazine. Unser neues Produkt, das JK7® Golden Face Oil ist in den News des “SwissSplit” vom Cosmopolitan Magazin erwähnt. JK7®’s famed Rejuvenating Serum Lotion recently had the unique and extremely fun opportunity of being featured on Season1, Episode2 of the VICELAND show, MOST EXPENSIVEST. The episode titled “Bill of Health” aired on December 1st and featured the show’s host, stylish and personable rapper, 2Chainz, researching and experiencing some of the highest end and most exclusive ways to enjoy “healthcare”. 2Chainz visited the Swiss founded Osswald Perfumery, located in Soho NYC, and was greeted and treated by the boutique’s owner Tanja Dreiding Wallace and sales woman extraordinaire, Josie Plumey. Always on a quest to enjoy the finest things in life, the rapper experienced “the glow of the dragon” from JK7®’s “Superman Serum”. Thank you 2Chainz and Osswald Perfumery! JK7® Lip Balm featured in the christmas gifts section of Grace Belgravia Magazine. Discover Saccharine Soul’s holiday gift guide – guaranteed to make every woman on your holiday list glow! We invite you to take a look at the latest issue of Middle East VIP Magazine (p. 57). Nina Hobson from The Expater loves the festive season – to drink and to be merry – but her skin doesn’t. In her Blog Article she tells us about her three favourite face masks that help her compensate… and our JK7® Perfecting & Replenishing Mask is number one! Brides, UK’s No. 1 Bridal Magazine, wanted to know, what the best facials for brides are… and the JK7® Signature Lifting Facial at Grace Belgravia is featured first! Jamie Rockers visited Grace Belgravia and enjoyed the JK7® Detox Refresh Facial. And she was completely taken with our products, which she felt are “a little secret”. Do you desire radiant, beautiful and healthy skin? A feature of our Secret Age-Defying Gel and 24H Cream in the Mandarin Oriental Hotel Group Magazine. Wenn Journalisten, Blogger und Influencer sich über neue Beauty-Produkte informieren möchten, dann ist beautypress® genau das richtige Portal dazu. Selbstverständlich war JK7 mit von der Partie. Simply Abu Dhabi works closely with a number of leading luxury brands like JK7. Every aspect of Simply Abu Dhabi has been designed to captivate the hearts of an elite audience. Let your skin tell you the truth. A feature of JK7® Luxurious Natural Skin Care in the new summer issue of FSMM Magazine. London – a diverse cup of tea. This issue of Swiss Magazine focuses on London – the home of our JK7 brand ambassador Lady Clare Milford Haven. You’ll find a one page feature of JK7® on page 135. Read more about the luxury selection by the editors of Art Quarterly Magazin. A feature of JK7® Luxurious Natural Skin Care in the the compendium by Centurion Magazine. Eustacia Huen from Forbes.com Lifestyle writes about the cost of our high-quality essential oil extracts, the anti-cancer properties of the mangosteen fruit extract and the years of research Dr. Jurgen Klein has put into our anti-aging serum. She also writes about what we can do, apart from skincare, to avoid skin-ageing: avoid Ultra Violet Rays, implement a healthy diet, and decreased stress. 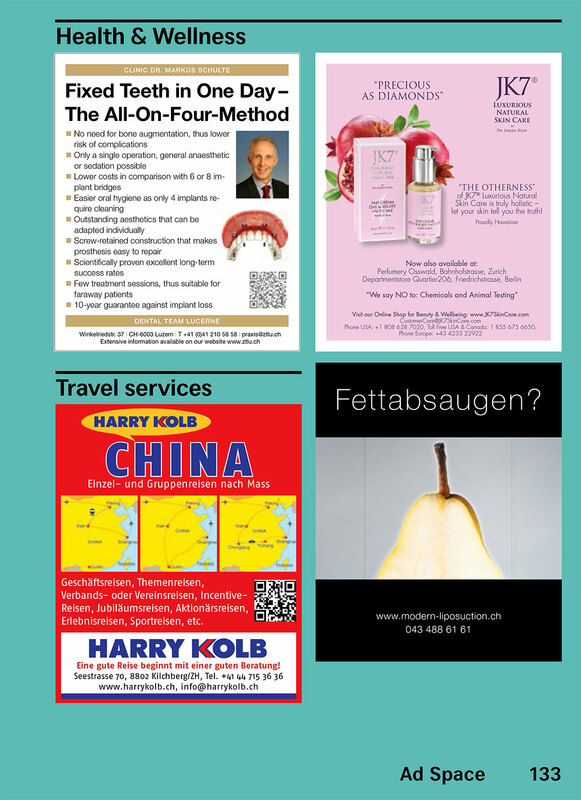 Also included in her article, is a note to consumers by ageing expert, Kaeberlei: „Consumers should be wary of the phrase ‘scientifically proven’.“ At JK7®, we do our best to create highly effective, organic skincare. So, as the scientific method can never completely “prove” anything, we invite you to test and find out the results for yourself. A feature of JK7® Luxurious Natural Skin Care in the the new issue of Hawaiian Airline’s Hana Hou Magazine. Katrin Roth vom annabelle Blog hat sich ein zweistündiges JK7® Luxury Treatment bei Osswald gegönnt und schreibt in ihrem Blog Artikel darüber: „Immer noch sehr präsent … sind mir die tollen Texturen und Düfte der JK7-Produkte sowie das wohlige Gefühl der Entspanntheit nach der Gesichtsbehandlung…“. A feature of JK7® Luxurious Natural Skin Care with Lady Claire Milford Haven in the new issue of OM Magazine. Steffi Hidber vom HeyPretty Blog hat sich bei Oswald eine JK7® Gesichtsbehandlung gegönnt. Auch wenn Sie von den Preisen unserer Produkte etwas verblüfft ist, war sie von der Behandlung voll überzeugt und empfiehlt sie auch ihren Leserinnen weiter… Ihr Blog-Artikel ist in seiner Ehrlichkeit und Blick von außen auf unsere Produkte sehr empfehlenswert! 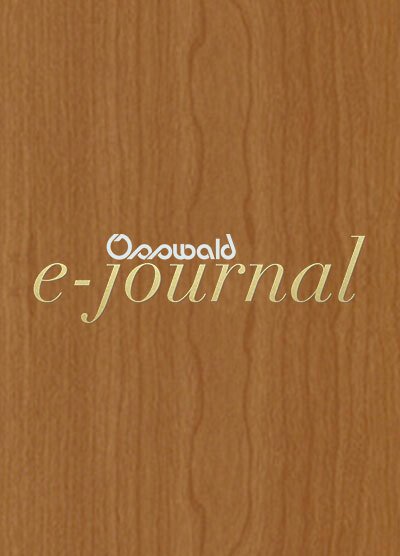 Blog post in Osswald’s e-journal. Advertorial about Jurgen Klein, Jurlique, JK7® and the JK7® philosophy. Andrea Six of the Neue Zürcher Zeitung writes about the advent of luxurious, all-natural beauty products, with an especial focus on JK7® and Infos by Karin Klein. 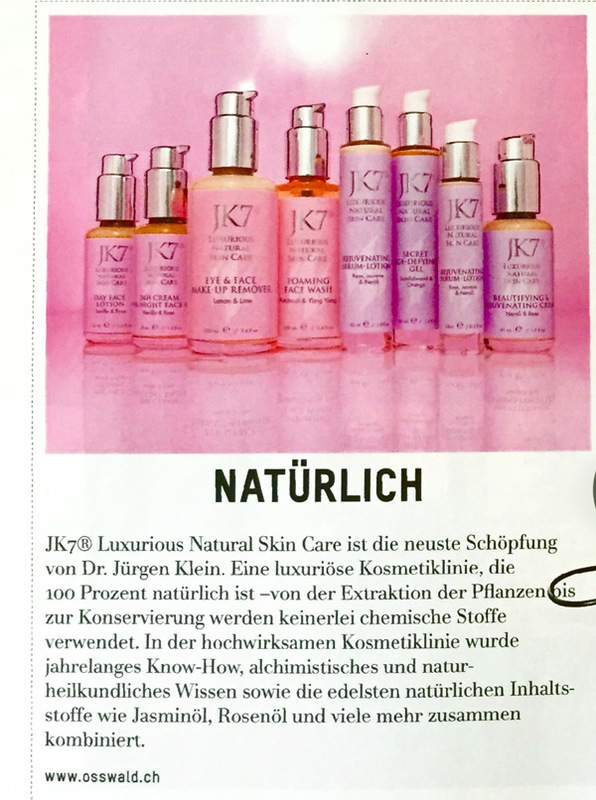 A feature of JK7® Luxurious Natural Skin Care in the new issue (September) of Swiss Magazin. A feature of JK7® Luxurious Natural Skin Care in the new issue of Hawaiian Airline’s Hana Hou Magazine. A feature of JK7® Luxurious Natural Skin Care in the new issue of Savoy Magazine. A feature of JK7® Luxurious Natural Skin Care in the Magazine for guests of Mandarin Oriental. Die JK7® 24H Cream – Day & Night Face Care wurde zum Liebling der Beauté Redaktion gewählt. A feature of JK7® Luxurious Natural Skin Care in the new issue of OM Magazine. 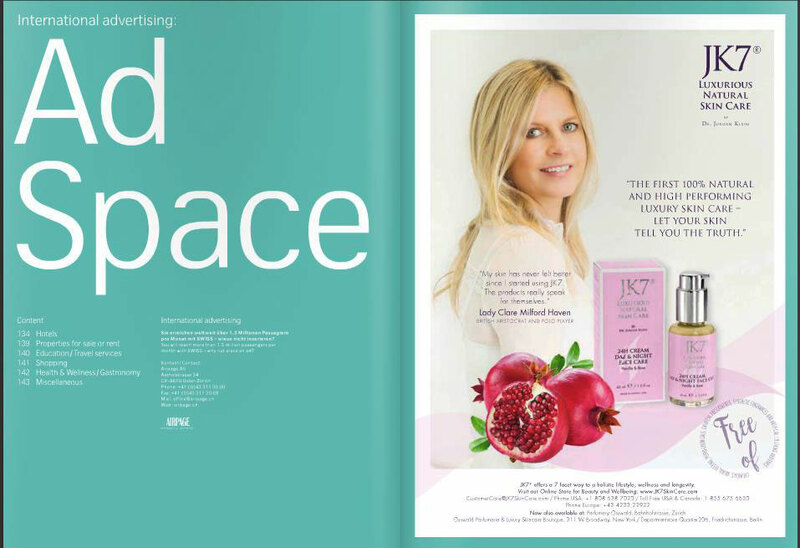 A feature of JK7® Luxurious Natural Skin Care in the new issue of Women in Business Magazine. Feature of JK7® Beautifying and Rejuvenating Cream in American Airways’ magazine “American Way”. A feature of the luxurious JK7® Spa & Wellness Retreat in Carinthia/Austria. 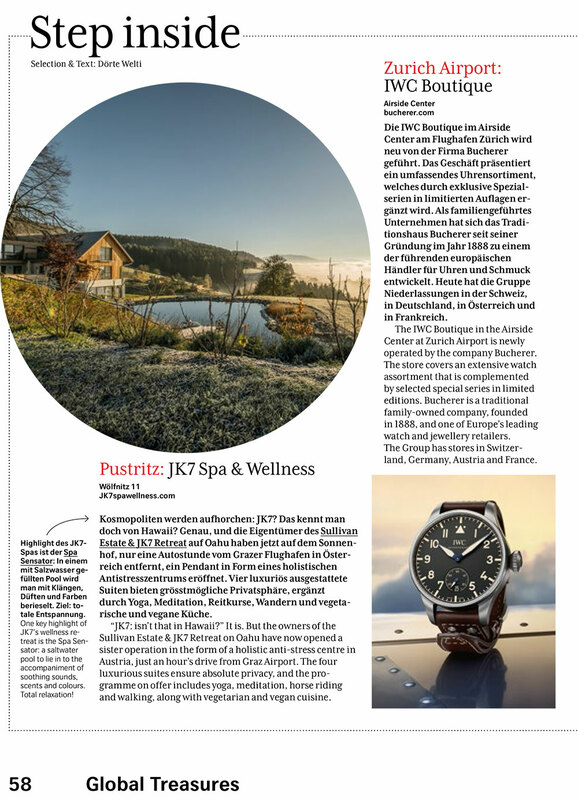 Swiss Magazine recommends the luxurious JK7® Spa & Wellness Retreat in Carinthia/Austria. A feature of JK7® Luxurious Natural Skin Care in the new issue of SWISS Magazine. A feature of JK7® Luxurious Natural Skin Care in the new issue of Art Quarterly. JK7® Ad in Hana Hou Magazine. 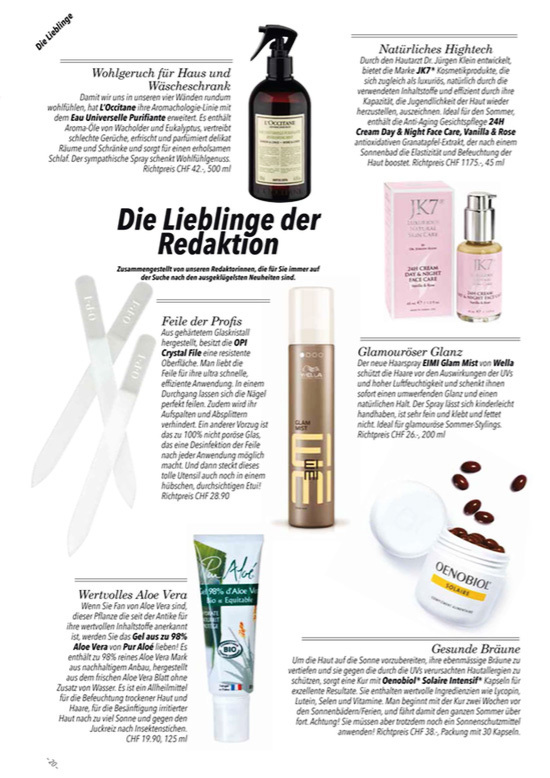 Im Masken-Special des FLAIR Magazins (April Ausgabe) darf die JK7® Detox Face Mask nicht fehlen. JK7® Luxurious Natural Skin Care is in this months Departure Magazine. The definitive source for the world’s best high-end travel, fashion, shopping, art, culture and more. JK7® Ad in the new Centurion Magazine..
A feature of JK7® Luxurious Natural Skin Care in the new issue of Omnia Magna Magazine. Online review of our 24h Day and Night Cream in dutch LXRY magazine. LXRY reviews and tests the most stylish, authentic and distinctive products. JK7® Ad in Swiss Magazine. A feature of JK7® Luxurious Natural Skin Care in the new issue of Figaro Magazine. In this comparison of 6 high-end Lip Balms, Malena Ruder from NZZ describes the JK7® Lip Balm as „Für Naturkinder“ (for nature-lovers). JK7® Ad in HI Luxury Magazine. JK7 is a „must have“! A feature of JK7 Luxurious Skincare in Sotheby’s Magazine. 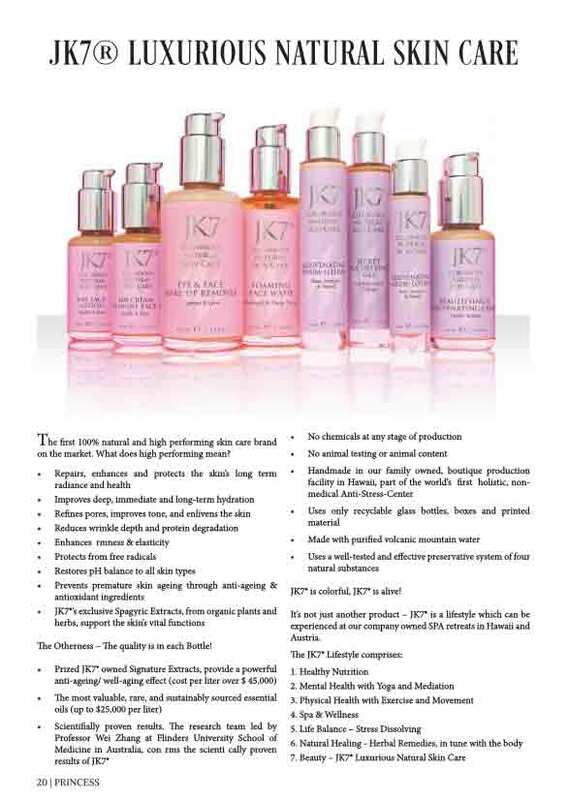 Karin Klein : "A Yes for life"
A feature of JK7 Luxurious Skincare in HI Luxury Magazine. A feature of JK7 Luxurious Skincare in Hana Hou! Magazine. A feature of JK7 Luxurious Skincare in Hana Hou! – The Magazin of Hawaiian Airlines. A feature of JK7 Luxurious Skincare in MO – The Magazine for guests of Mandarin Oriental. A feature of JK7 Luxurious Skincare in OM – Omnia Magna Industry Magazine. 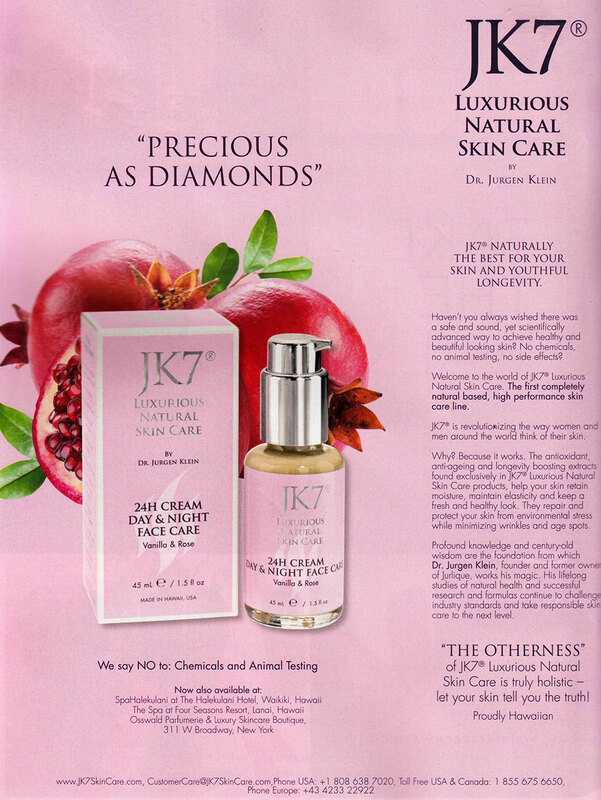 A feature of JK7 Luxurious Skincare in AQ Magazine. A feature of JK7 Luxurious Skincare in Omnia Magna Magazine. Article about JK7 in Japanese Shihostyle Blog. Featured in Austrian AQ Magazine. The Sullivan Estate & Spa Retreat and JK7® Skin Care featured under “Living Nature” in japanese “Girls Loco Hawaii”. Our Skin Care Line is once again featured in LeaLea magazine. Our Skin Care Line is featured in LeaLea magazine. HiLuxury magazine believes, if anybody on earth can back the claim to create “the most unique, professional and high performing skin care in the world”, it’s Dr. Jurgen Klein. Organic Spa Magazine features our JK7® Day Face Lotion.